Windows 7, Microsoft’s follow-on to Windows Vista, will become commercially available in October 2009. For Microsoft, the launch of Window 7 suggests strong growth in client operating systems again. But the impact of Windows 7 will reach far beyond Microsoft, driving revenues and growth for many of the IT companies worldwide that sell hardware, write software, provide IT services, or serve as IT distribution channels. – By the end of 2010, more than 7 million people worldwide in the IT industry and at IT using organizations will be working with Window 7, or 19% of the global IT workforce. – The 350,000-plus IT companies that produce, sell, or distribute products or services running on Windows 7 will employ 3 million; another 4 million will be employed at IT-using firms. – For every dollar of Microsoft revenue from launch in October 2009 to the end of 2010 from Windows 7, the ecosystem beyond Microsoft will reap $18.52. – During that period, this ecosystem will sell more than $320 billion in products and services revolving around Windows 7. In 2011: Windows 7 will be used by nearly 75% Windows users. Vista will drop to 0 .5%. Download pdf report from Microsoft. I think XP will not fall below the majority for a long time to come. 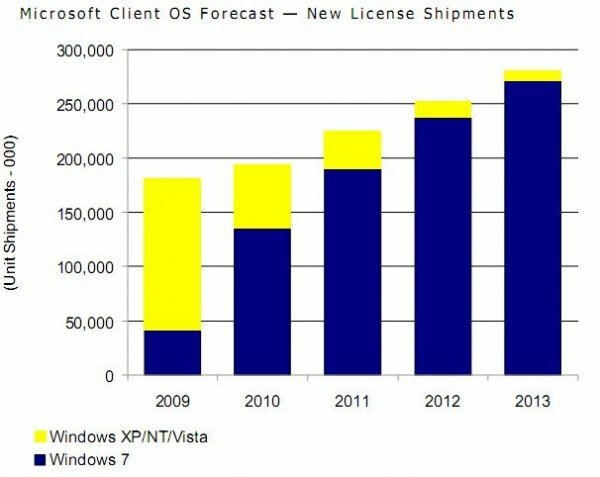 It’s going to be hard for Windows 7 to overtake Windows XP.